he writer Catesby Leigh, who muses on "Why Presidential Portraiture Lost Its Stature" in the Wall Street Journal (January 18, 2007, page D7), draws a conclusion that is at odds with, and is disconnected from, the expectations of contemporary portrait painting. Author Leigh makes two fundamentally wrong assumptions about portraiture: (1) that symbolism, "poetry," and "inspiringness" are desirable or defining virtues in a portrait of an American president; and (2) that realismor naturalismis somehow synonymous with, and servant to, the technology of photography. Leigh considers "bland" is, in fact, ten times more evocative of a living, breathing human being than is the theatrical, artificial and contrived Washington by Gilbert Stuart. Leigh is correct in constructing a fundamental division, placing most portraits in one of two broad categories: (1) those that embody symbolism and/or "props" that are intended to convey content and meaning, and (2) those portraits that concentrate on the character and persona of the subjectin other words, portraits that present the subject as a human being rather than a role-player. This latter category is seen as mostly post-Sargent, and perception-based (another correct concept). But I would like to argue that Leigh's basic thesis is exactly upside-down. Leigh argues that presidential portraiture lost its stature when it turned from the creation of paintings redolent of symbolism and the aura of authority, and turned instead to the up-close portrayal of the President as an approachable and understandable human being. The two portraits selected by Leigh to illustrate his thesis are in fact perfect to illustrate mine, (that he has it backward). 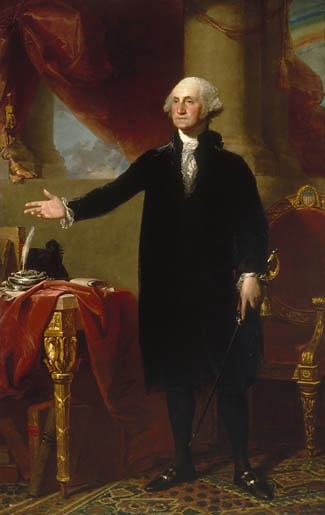 I would contend that the "Landsdowne" George Washington, by Gilbert Stuart, is stagey, contrived and artificial. The subject is made to stand forever in a theatrical or oratorical pose (which I suspect was totally uncharacteristic of the man) surrounded by grandiose furnishings that serve only as allusions to history. Nothing here, either in the setting or the pose, is real. We are told virtually nothing about George Washington the human being, apart from the consensus that he was a strong and admired leader of men. On the other hand, the portrayal of President Ford by Everett Raymond Kinstler eschews the well-known (by now) trappings of Presidential power. We do not need to be reminded of Air Force One, or seried ranks of soldiers, or long motorcades with flashing lights, or even the stately columns of the White House. Gerald Ford the individual is offered to our gaze. We are able to form an estimate of his personal warmth (or lack thereof), his dignified mien, his potential as a family head as well as civic magistratethrough artist Kinstler's vividly impressionistic capture. We are permitted to form an estimate of Gerald Ford the man. If both men were to suddenly walk into the room, we would not be surprised by Ford. He would look and act like the man we have met in the portrait. Washington, on the other hand, would very likely be totally unlike the remote and unnatural figure portrayed in the Stuart painting. 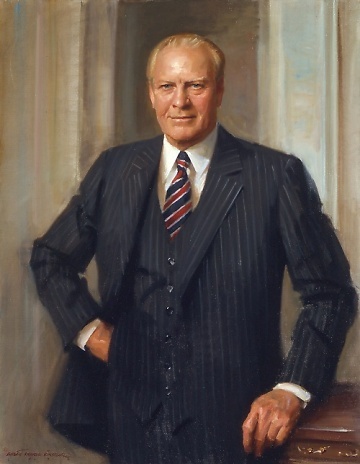 The portrait of President Gerald Ford by Kinstler, which Leigh considers "bland" is, in fact, ten times more evocative of a living, breathing human being than is the theatrical, artificial and contrived Washington by Gilbert Stuart. The Stuart Washington is determinedly remote, statuesque and self-conscious, while the Ford portrayal gives us a real person, up close, devoid of pretense or pomposity. The Ford painting is incredibly real and convincing, while the Stuart Washington places impossible barriers of artifice and stagecraft between us and the subject. The viewer may study the Stuart exhaustively and still wonder, "What did this man look like; what type of human being was he?" The Ford painting, on the other hand, conveys the impression of a palpable, authentic personality, brought right up close for our intimate scrutiny and comprehension. Times have changed in portraiture. Leadersboth in politics and in businessdecry any pretension or "posing." Leaders ask to be portrayed as "natural," "likeable," "approachable," etc. As a professional portrait painter myself, I've never been asked to work toward an Olympian or heroic result. Just the opposite. In my own portrait practice (now spanning some forty years and perhaps 600 sitters), subjects specifically expect to be portrayed as down-to-earth, friendly and unpretentious. Imagine for a moment if a painter in 2007 produced an image of George W. Bush on a Lansdowne-sized canvas, complete with heroic gesture and the trappings of Roman power. The firestorm of ridicule in the media would be breathtaking. Writer Leigh is correct in placing John Singer Sargent at the pivotal turning point in not only American, but world portraiture as well, by pointing out that Sargent's goal was the capturing of an immediate, impressionistic appearance of reality. The heroic aspect of Sargent's portrait of Theodore Roosevelt is a result of the subject's personality and instinctive inclinations, rather than a conscious attempt by the artist to achieve "gravitas" or inspiring stature. Leigh's charge that today's portraitists are slaves to their photographic reference material has, unfortunately, some merit. In a media-drenched society, it is increasingly difficult for today's painters to break free of sources and give a painted record that is totally perception-based. But it is significant to note that today's leading portraitists are precisely those who are making the attempt. It is easy to agree with author Leigh when he posits that too much of contemporary portraiture (and in particular, presidential portraiture) can be bland and ordinary. One suspects that many portraits by other artists in Gilbert Stuart's day were ordinary, as well. But today's painters are at least aiming at portraying their subjects in the primarily human dimension. There probably will not be Lansdowne-style portrait of Barack Obama or Hillary Clinton. It is probably just as well. Click here to read the original Wall Street Journal article.